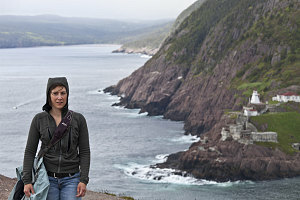 Our last day on the island of Newfoundland dawned foggy, grey, and cool. 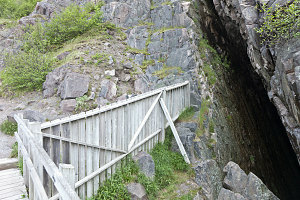 Fairly normal, and at least there was no rain. 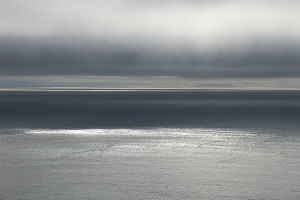 The cloud deck was high enough that the panorama from our hotel room was still impressive. 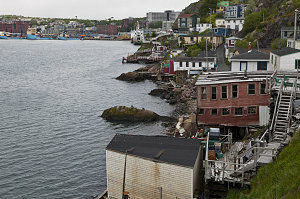 In the daylight, we had a better view of the rows of row houses, the ships docked in the harbour, and the various landmarks and churches. 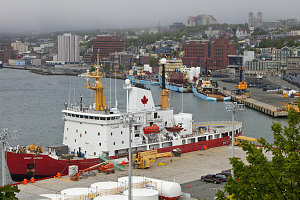 Straight away, we noticed a couple of interesting ships in the harbour. 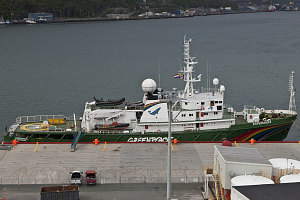 The first was a rainbow-hulled ship - the Greenpeace vessel Esperanza. 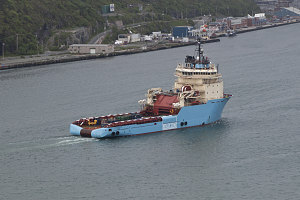 Quite a surprise to see such a well-known vessel. 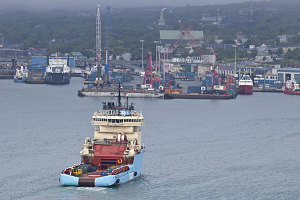 I had heard something in the news about Greenpeace protesting something about Newfoundland's offshore oil fields, and I figured the Esperanza must be here for some reason related to that. 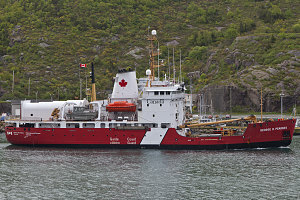 Also interesting was the fact that the Canadian Coast Guard ship Henry Larsen was docked right next to Esperanza, parked bow-to-bow with it. 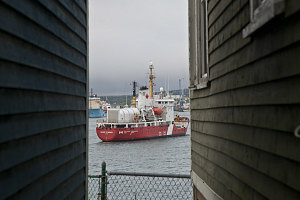 It almost seemed like a matchup was brewing between 'Authority' and 'Activist', except that instead of a protester versus a policeman, it was ship-to-ship. 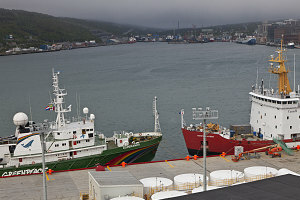 Our time today was tight - we had until approximately 2pm before we had to make our way out of St. John's and over to the ferry terminal at Argentia Bay. That meant efficiency and speed were important. 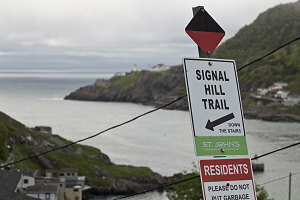 The first place we decided to visit was Signal Hill. 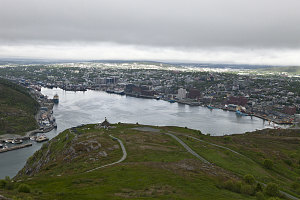 In addition to being very scenic and providing fantastic bird's eye views down to St. John's, Signal Hill is an important historical landmark: many centuries as a fortified defense point, and then as the birthplace of wireless transmissions. 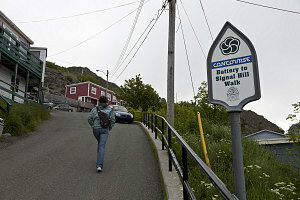 Since our hotel was on the lower slopes of Signal Hill, we simply left our room and started walking. 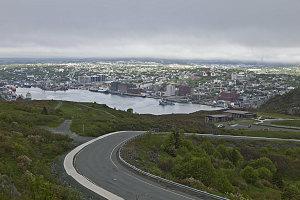 We chose to do a loop that led through a historic and quirky old neighbourhood, then onto a walking/hiking trail that led past the harbour narrows, out to the headlands, and then up to the top of Signal Hill. 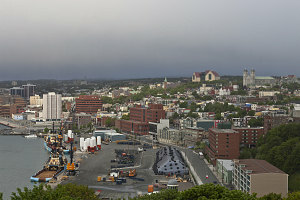 Jammed in between the steep slopes and cliffs of Signal Hill and the water of St. John's harbour is the neighborhood called The Battery. 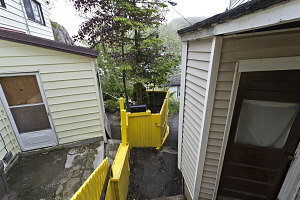 It's one of the oldest neighborhoods in St. John's, and it is a haphazard arrangement of homes, some quite old and some quite battered, with little laneways and small roads. 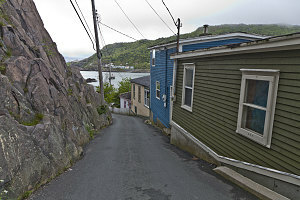 The first part of our walk went through this very interesting spot, and I found it a bit like walking the narrow alleys of a cliff-bound mediterranean coastal town, but with a old-salt maritime flair. 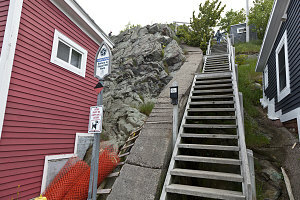 Over the course of the years, The Battery neighborhood has suffered some damage from storms and flood tides - the most recent being just a few years ago. 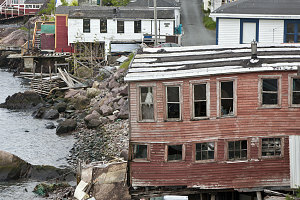 While walking through the neighborhood, we noticed several very old structures near the water that seemed to be on the verge of collapse. 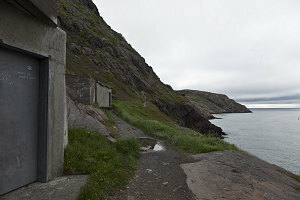 At the far end of The Battery neighborhood, we reached the start of the Signal Hill Trail. 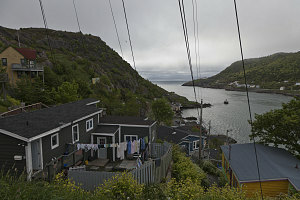 We left the buildings and houses behind, walking east along a narrow path that traversed above the narrows of the harbour and below the cliffs of Signal Hill. 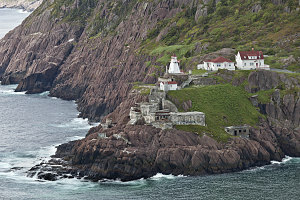 The narrows are quite a rugged and beautiful spot; across the narrows is the emplacement of Fort Amerhest, its buildings perched scenically on the criss-cross jointed bedrock of South Head. 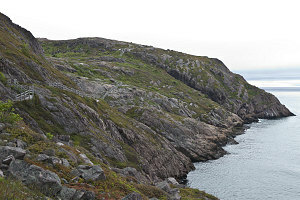 After reaching the Atlantic (where, hopefully, we saw a patch or two of sun), the trail swung around to follow the coast for a few minutes, then back west and started to ascend up to the top of Signal Hill. 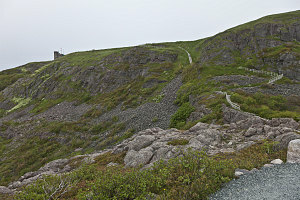 We could see the Gothic architecture of the Cabot Tower on the summit, awaiting our arrival. 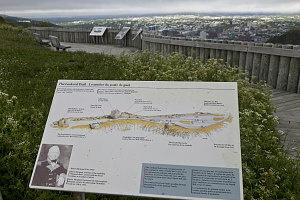 Soon we arrived at the top of Signal Hill, and took in some of the plaques describing the important historical events that occurred here. 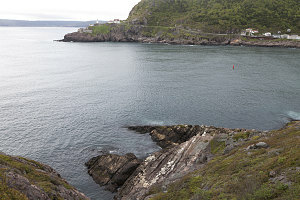 Newfoundland's history as an important British colony for hundreds of years meant that this strategic lookout over the harbour had a military use for a long, long time. 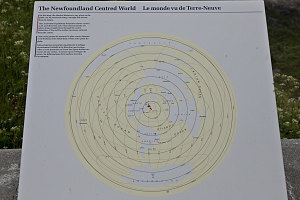 Newfoundland - Center of the World? 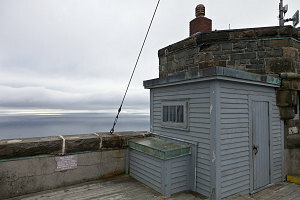 We then went into the Cabot Tower, a blocky Gothic structure that contains a small shop, displays and remnants of Marconi's early work, and an observation deck on top. 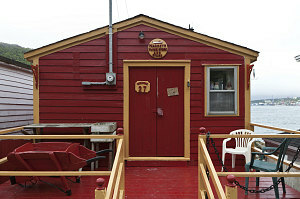 There was no fee charged to visit the building. 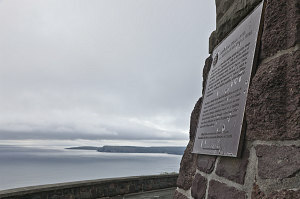 Built in 1897 to commemorate the 400th anniversary of Newfoundland's discovery by John Cabot, it was soon put to use for a more technical purpose - the first trans-Atlantic wireless transmissions by Guglielmo Marconi. 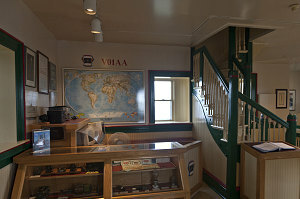 I found it very cool that there is a spot next to some of Marconi's old equipment that has the radio call sign for Signal Hill - V01AA. 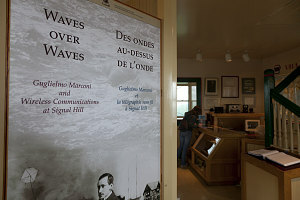 I suppose you might consider this the very first callsign, although I suppose it is more likely that the scheme was put in place sometime after the earliest radio transmissions. 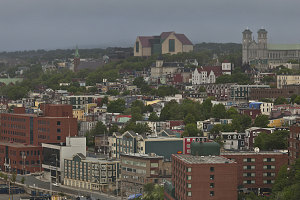 Up on the roof, there's a spectacular 360-degree view. 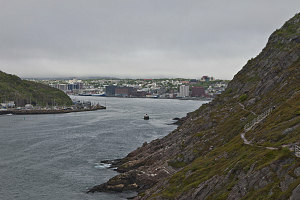 Out to sea, along the coast, down to the Queen's Battery, and down to the city center. 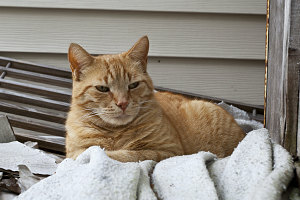 A most excellent viewpoint.